As to the garden, it seems to me its chief fruit is--blackbirds. Preserving fruit was always necessary for the cottager of old. There was no waste back then, their survival depended on it. The preserved fruit and vegetables also gave a welcome change in the diet over the lean winter months, adding a different flavour to otherwise monotonous meals. When you are preserving either fruit or vegetables make sure that you only use organic produce in perfect condition, if its bruised or over ripe it will not preserve well. As the cottage gardener follows organic gardening this should not be a problem. You can preserve fruit by storing, freezing, drying, bottling and conserving. For more information about preserving vegetables and saving vegetable seeds read ezine #005 October 2011 issue titled “Preserving Vegetables and Saving Vegetable Seeds”. Fruit: Such as cottage favourites apples, pears, and cottage rare traditional favourites medlars, bullace, chequers and quinces. ~Store apples in newspaper in boxes in the shed. Use within six months. ~Pears ripen when put in a warm place, store them in a cool place, then bring them inside a day or so before you need to use them. Fruit: Apples and plums currants and berries. ~Open-freeze currants on their stems and berries on trays before storing. ~Slice apples and plums and drizzle with lemon and sugar before freezing in small quantities. Use within six months. ~You can also freeze the juice of apples, pears and plums in small quantities, drinking the juice fresh will give you the most nutrition but this is a good use of a glut and the juice can be used in cooking. ~Making Chutney will be covered in a later article. Fruit: Currants, plums, gooseberries, strawberries, raspberries, rhubarb, blackberries and hedgerow fruit. ~Making jam will be covered in a later article. Fruit: Pears, apples and plums. cherries, currants, raspberries, strawberries, gooseberries rhubarb, blackberries and hedgerow fruit. Bottling fruit is the old fashioned equivalent of canning fruit that the cottager could do at home. Most fruits are not bottled these days as many freeze well, the exception being pears. For the most part bottling is done just for the taste of childhood, simply for a flavour once enjoyed in the past. Bottling is a method of preserving food by heating. The heat between 74-100 degrees C (165-212 degrees F) will kill off the germs and create a vacuum that seals the container and prevents recontamination. Foods high in acid like fruit and tomatoes can be sterilised at 100 degrees C (212 degrees F). Once cooked the colour and flavour of the fruit will be not as appealing as when fresh but over the winter months when fruit is out of season it will be appreciated. Bottled fruit can be used in pies or just served with custard or cream. You will need special glass jars, preserving jars- Mason or Kilner jars are the most popular, sterilize first. If your jar has a rubber seal or spring top make sure that it is in perfect condition, you must boil the rubber seal before using, it is best to use new ones each time. Clean them in hot soapy water and dry. You can sterilize the jars in the oven at 160 degrees C/325 degrees F/gas mark3. After cleaning fruit in perfect condition, apples and pears should be peeled, cored and sectioned, pack into the jars and then top up the jars with syrup or cold water, but never fill over the filling line. Close the jar immediately and clean the rubber ring. Now put the jars into a large saucepan with a raised (false) bottom of wood slats or a rack so the jars don’t touch the bottom. Cover the jars with water about 3cm (1 ¼ in) over the top. Slowly heat and keep simmering at 74 degrees C (165 degrees F) for ten minutes for most soft fruit and at 82 degrees C (180 degrees F) for harder fruit such as rhubarb, plums, apples and pears for fifteen minutes. You can always cook it to 100 degrees C (212 degrees F) for 20 minutes to be absolutely sure but the fruit will be less attractive. If you are following a recipe follow it faithfully. A thermometer is necessary to be on the safe side. Carefully remove the jars and put out to cool slightly, close the lids while still warm to create a vacuum. To check that the jar is airtight try to lift it up by the lid. If not sealed properly refrigerate and eat in two days. Store bottles in a cool, dark place and eat within a year. Always check the seal has not broken on any stored bottled produce before you eat it. If it has broken, or if you have any doubts, throw it away. ~To make syrup: 225g (1 cup) sugar dissolved in 670ml (2 ½ cups) boiled water. ~To make brine: 10g salt dissolved in two tsp citric acid in 1 litre boiling water. For bottling tomatoes. The recipe for boiled fruit above comes from the book “The Cottage Garden” by Christopher Lloyd and Richard Bird. For many more recipes on preserving fruit I always refer to the wonderful book that every cottager should have “Forgotten Skills of Cooking” by Darina Allen. The recipe below is from the “Forgotten Skills of Cooking” I like this recipe as I can use the oven which I prefer. Juice and zest of 1 organic lemon. 1) Preheat oven to 100 degrees C/200 degrees F.
2) Peel and core the pears carefully. Half or quarter them, keeping a good shape. Put in casserole. Add sugar and juice. 3) Cover with a tight fitting lid and cook gently in the oven, for 2 1/2 -3 hours, until tender and translucent. 4) Bottle immediately and store in a cool, dry place. It’s starting to cool a little this month and its time to prepare the cottage garden for winter. Wildlife will need a little help during the cooler months wildlife may also be nesting in bonfire heaps and inside chimneys so before you light any fires check first. You will have an abundance of leaves which make great leaf mould that can be used in containers. It may take a year or so till its ready, if this is not practical use leaves that do not have disease as a mulch layer to protect your plants over winter. So grab your diary and organise your gardening to do list with ECL’s November Calendar. 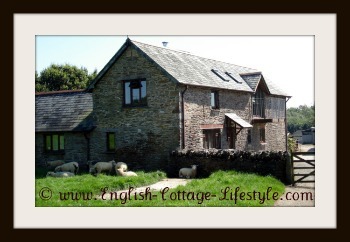 In October I began my Cottage Tour of England starting in the stunning South West. I have been travelling around the South of Devon for the last few months and I have many photos and stories to tell. 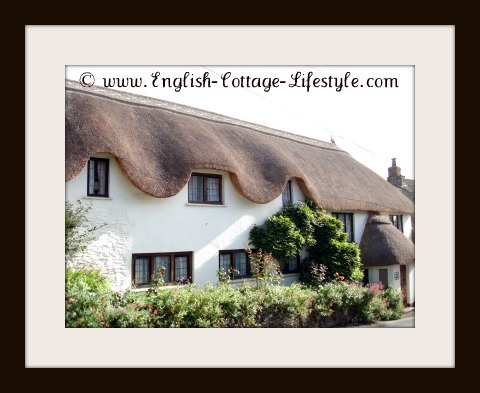 The weather was amazing and if you like a little armchair travel then stay tuned to English Cottage Lifestyle for more. So get cosy with a cup of tea and travel to the stunning South West of England. Roast Partridge with butternut squash and leeks. 1)Pre heat oven to 200 degrees C/400 degrees F/gas mark 6 or use the roasting oven in your aga. 2)Rub butter in a roasting pan and put the green ends of leeks in the middle to rest the partridges on. This will prevent over drying. 3)Rub butter over partridges, season with a little salt and pepper and then wrap streaky bacon around the birds. It is best to cook the partridges upside down on their breasts so that juices do not run out. 4)Line the roasting pan with the butternut squash and leeks around the partridges and add a few dollops of butter over the vegetables. 5)Place in the warm oven and roast until ready. The time will depend on your oven and the size of the partridges. Check after 15 to 20 minutes, baste the partridge and the vegetables in the butter and bacon juices and cook until done. ~Mine took about 40 minutes in the aga as the aga oven had cooled off because I was making mashed potato on the hot plates at the same time. Partridge can dry out and be horrible so keep an eye on it. Cooking it upside down on the breast means that the skin will look pale, but it will taste yummy. I used the buttery vegetable juices as a ‘gravy’ and it was heavenly.